Alaska's Last Two Blockbuster Stores are Closing, Leaving Only 1 in the U.S. Even after receiving some attention from Last Week Tonight With John Oliver and being gifted some movie memorabilia in the form of the jock strap worn by Russell Crow in 2005’s Cinderella Man, the reality of the modern media landscape couldn’t be held back from reaching Alaska forever. For loyal patrons of some of the nation’s last remaining Blockbuster Video rental stores, the unthinkable has happened: Blockbuster is finally finished with Alaska. The former media empire’s last two Alaska locations in Anchorange and Fairbanks will officially close for rental business this coming Monday, according to the owner of both locations. The stores will reopen on Tuesday for inventory sales that will clear out the last remaining media materials, marking the end of an era. The only remaining Blockbuster in the U.S.? It’s located in Bend, OR, where we can only assume that a thriving hipster population is ironically keeping it afloat. 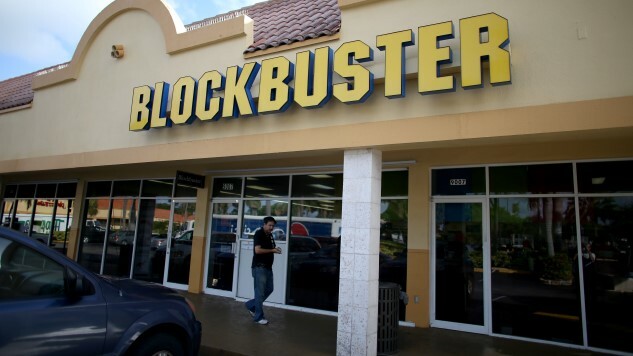 As recently as 2013, Alaska had remained a fairly strong holdout for Blockbuster Video stores, with 13 brick-and-mortar locations, but that number quickly dwindled. The brand was able to survive for a time thanks to prohibitively high prices for high-speed internet connections in the U.S.’s most remote state, but as connectivity has increased, even the value represented by Blockbuster was eventually rendered moot. Owner Alan Payne apparently determined as long as nine months ago that it would no longer make financial sense to keep the last two Alaskan Blockbusters open, once their leases expired at the end of August. The final two locations are still profitable, he told the ADN, but that profit margin is on the decline, and nothing is about to bring it back. As for the Bend location, it’s stated no intentions to close, even though it now has the odd distinction of being the last Blockbuster of a chain that once had more than 4,500 locations in the U.S. Speaking with the ADN, the Bend location general manager, Sandi Harding, said she was shocked to find out that her store would soon be the last remaining Blockbuster. Sounds pretty lonely. And is it just us, or would The Last Blockbuster be a pretty interesting subject for a feature film?